Mumbai: ITC’s Foods Division today announced that B Natural Juices & Beverages will shift its entire fruit beverage portfolio to `Not from Concentrate’range. With this paradigm shift, the brand endeavors to offer its consumers, juices & beverages that are made from fruit pulp and not from fruit concentrate. This shift towards a Not From Concentrate range is in line with ITC Foods’ vision and commitment towards crafting differentiated offerings in this category. B Natural had forayed into the concentrate free fruit juices segment last year with the launch of B Natural 100% Pomegranate Juice. The resultant success of the launch and the encouraging consumer response strengthened the brand’s resolve to offer fruit juices that are made from fruit pulp and not from concentrate. Over the past 3 years the brand has introduced many unique products in the market. From introducing the regionally differentiated offerings like Punjab da Kinnow, Bael & Phalsa to shift the portfolio to concentrate free juices, B Natural is clearly focused on taking a big leap in this category. B Natural’s transition towards the ‘Not from Concentrate’ range is powered by ITC’s deep engagement in the agricultural sector including the celebrated e-Choupal model. Its strong and long standing farmer relationships andits efforts to strengthen and nurture agricultural value chain shave been key drivers of this unique endeavor. With this approach, ITC Foods has set up arobust supply chain by encouraging procurement&processing of fruits from Indian farmers, thereby empowering the Indian agrarian economy. The Not from Concentrate initiative is also aimed at furthering investments in the fruit processing industry which will lead to more job creation in the sector as well as address the problem of agri-wastages. Mr. Hemant Malik, Divisional Chief Executive, ITC Foods Division, said, “The B Natural ‘Not from Concentrate’ range is set to redefine the way packaged juices have been consumed in India since its inception. We take pride in offering consumers innovations that have been crafted by years of intensive research.The B Natural Not From Concentrate range has been created with Indian fruits sourced from Indian farmers.Our institutional strength of agri sourcing capabilities provides a distinct competitive advantage which enables us to make leading strides in the foods business. B Natura’s unique range was announced at a commemorative event in Mumbai at Bandstand in Bandra. 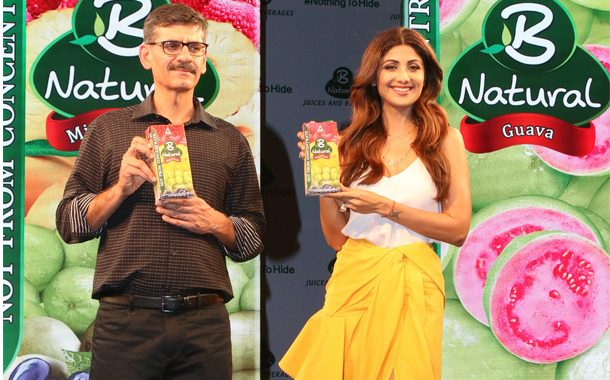 Brand ambassador Shilpa Shetty joined the company spokesperson in taking the pledge to make B Natural Juices concentrate free. B Natural Juices & Beverages are manufactured and packed at a state-of-the-art manufacturing facility in Bengaluru. It is packed in a six-layer Tetra Pak packaging, which helps retain the freshness and taste of the fruit juice, without the need for added preservatives. B Natural Not from Concentrate Juices & Beverages can be easily identified with the addition of a beautifully adorned green ribbon in the left of the pack which communicates the proposition of `Not From Concentrate’ precisely. B Natural Not from Concentrate Juices & Beverages will be available at all modern formats and top-end general trade outlets across India. It will be available in 1 L pack size starting from Rs. 99 onwards and 200 ml priced at Rs 20 respectively.